Funny how smartwatches ignored decades of watch design and years of fashion watch style until recently. The tech companies actually thought they could do better. (OK, OK, the Apple Watch is interesting from a design point of view and kinda iconic but everything else so far has pretty much sucked). Here are some pictures of designer smartwatches that get things right precisely because they mimic existing, often bestselling, watch models. They're not identical though and some things need to change to accommodate the tech, charging ports and touchscreens. Play spot the difference with us, would you? When I first saw the press pics of the gold Michael Kors Access, I nodded sagely. "Three of my friends have that exact Michael Kors watch," I said. "That will sell well." While I was reviewing said Access, I tracked down one of these particular friends as I had a skewed memory of what her watch looked like. In person it was smaller than I remembered. The first thing she said when she saw my gold gadget? "That's huge!" The size is the main difference. Still, you can see the details that have remained on the watch body, finish and watch faces as well as what was modified - the crown, the extra buttons, the lugs, the recessing of the display/watch face. The overall look and feel of the dumb MK watch does feel more premium on the wrist; it's hard to put your finger on exactly why. Of course Fossil Group is behind a lot of these watch-to-smartwatch conversions including the Michael Kors Access. Go to its Oxford Street, London store and it's tricky to tell the hybrids and traditional watches apart - more obvious with the touchscreen watches which are presented front and centre. Fossil has taken exact colour finishes as well as crown, lug and watch body details from its existing lines for smartwatches like the Q Marshal and Q Wander. 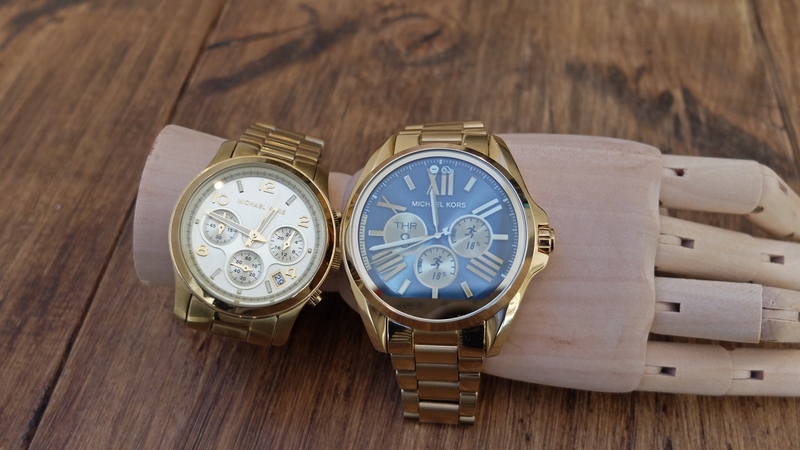 I took a look at a few of the womens and mens watches and played spot the difference. Size isn't so much of an issue on the men's side as some of Fossil's regular watches are massive. Strap-wise, they look pretty much identical as expected. With hybrid smartwatches, it's a lot easier to match the look, size and overall feel of traditional wristwatches. And with the Hugo Boss Smart Classic, our editor Michael Sawh was impressed by how much it looked like any other Hugo Boss watch at first glance (if the little screen wasn't blaring an alert at you). Indeed, when I was snapping the Smart Classic next to a very similar HB model I had to do a double take to make sure I knew which one was which. The Smart Classic is chunkier, that's the main difference, but it isn't actually that much heavier - unlike the Michael Kors - so that's a plus in its favour.